Otherwise called the 'Strangling Angel of Children', diphtheria was for long a dreaded yet common childhood illness. In fact, until a few centuries back in New England, it was solely responsible for 80pct of the deaths of children under 10 years. Eventhough vaccines have been developed, poor public health measures have caused the re-emergence of the disease. For more details, our support group on diphtheria is the place to be. 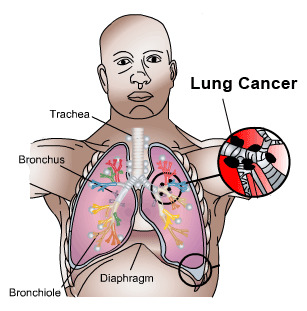 Lung cancer is the uncontrolled and abnormal growth of cells in the lung. It is strongly linked to smoking, and is the largest killer cancer of men in the United States. The main symptoms of lung cancer are shortness of breath, weight loss, and coughing (sometimes coughing blood). Join our online support group for people with lung cancer and their families. Talk with others facing the same challenges and specialists who can help.